This essay outlines a number of philosophies and strategies pertaining to the instruction of free musical improvisation. In Section 1 the reader is introduced to the eXperimental Improv Ensemble (XIE), which serves as a model throughout the essay; some broad challenges facing the director of such an ensemble are presented. Sections 2 and 3 describe the ensemble’s performance æsthetic and technical environment. Section 4, the centrepiece of the paper, touches on a wide range of pedagogical issues including subjectivity, detachment, awareness, meditation, role-playing, listening, self-reflection, practice, collective learning, collaboration, and interdisciplinarity. Section 5 closes the essay by revisiting some key themes. I lead a group called the eXperimental Improv Ensemble — the XIE, pronounced “shay.” (1) The XIE is an eclectic, interdisciplinary performance ensemble whose activities vary widely, ranging from live soundtrack performance to sound installation design. The ensemble is very close to my heart, and I sometimes forget that its members are my students. The student ensemble officially began two years ago, though it had been stumbling into existence for a few years before that, during which time I led a number of extracurricular jam sessions for the students of my Composition Seminar at the University of Manitoba. At the urgings of these students, and with the support of my colleagues, I decided to make the XIE an official offering in September 2006. I was initially expecting very few students to register for the ensemble — primarily my own Composition students. Concerned that I may not get even that, I posted a few advertisements around the Music Building and in some other departments across campus. To my surprise, more than a dozen curious souls showed up on the first day, including not only classical and jazz students from the Faculty of Music, but also students from Computer Science, Film Studies, and the School of Art. In the end the ensemble was so large that I found it necessary to divide the class into two groups, which often ran simultaneously in adjacent rooms. The greatest demographical surprise, however, came not from other departments but from within the Faculty of Music: opera singers! I had not even entertained this possibility. The interest from Computer Science, Film Studies, and Art was not entirely unexpected; in fact, it was partly by design. But opera singers! Wouldn’t these highly trained singers, so heavily cloaked in tradition, have difficulty working within an experimental æsthetic? Wouldn’t improvisation be foreign to their very fibre? More generally, questions about how to lead such an ensemble abounded: How does one structure a rehearsal of free improvisation? Is the imposition of structure itself antithetical to the underlying philosophy of the art form? How does one develop the ability to express oneself spontaneously? In essence, how does one teach freedom? Initially at a loss, I leaned on my colleagues for help. Slowly we began to make some progress. Eventually a path — one richer than I had imagined — began to reveal itself. Below I outline some of the ways in which I now approach these and other ensemble challenges. Before doing so, however, it may be useful to present a clearer picture of the ensemble’s æsthetic direction by briefly describing our approach to performance and technology. The XIE is truly a performance ensemble, giving roughly a dozen shows a year. Our schedule includes some rather conventional events, such as pre-concert performances at the Winnipeg New Music Festival, and some rather unconventional events, such as our site-specific vertical sound installation created in 2007 for “Ecotopia: Water,” a serial project of the Museum of Clear Ideas (curated by Suzanne Gillies and Peter Roy). For this project, loudspeakers were placed in the open windows of a six-story building in Winnipeg’s historic Exchange District. Water-based electroacoustics were then broadcast through the expansive multi-speaker system, transforming the urban canyon below into a lively river of sound; for passers by, the effect was one of thundering cascades falling from a sonic monolith. In 2009 the XIE will perform live soundtracks to classic film shorts at Winnipeg’s premiere alternative theatre, Cinémathèque. Presented by GroundSwell, the event will feature theatrical, spatial and interactive elements to complement the film presentations. Figure 1. The XIE gives a pre-concert performance at the Winnipeg New Music Festival. Photo © 2007 Gordon Fitzell. The centrepiece of our performance work, however, is Jamming the Dragon — an open stage for improvised experimental music, which we host monthly at a private open-loft studio. The raw, spacious interior provides an inspiring atmosphere for creative expression. Now beginning its second year, Jamming the Dragon regularly attracts a variety of community players. The series also features a number of special guests each year. 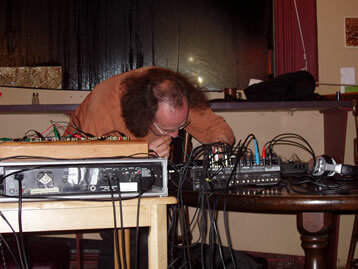 In 2007, for example, we were pleased to welcome to our stage Vancouver electronics wizard Giorgio Magnanensi, who gave a masterful performance on circuit-bent toys. Figure 2. 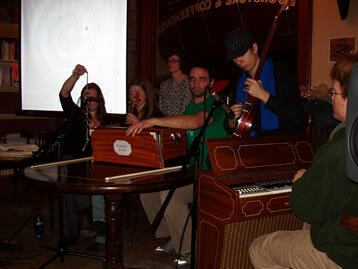 Special guest Giorgio Magnanensi performs circuit-bent toys at Jamming the Dragon in Winnipeg. Photo © 2007 Gordon Fitzell. The XIE typically performs in an electronic environment. On occasion we give acoustic performances, such as for performance-installations in which the architectural elements of a space serve as the musical instruments. Sounds are generally routed through a multichannel audio interface (MOTU’s Traveler) to a laptop and mixer, where I control the main mix and provide additional electronics — notably real-time processing and improvised looping of on-the-fly recordings. For real-time processing I use a variety of applications and plug-ins including Logic and Max/MSP; for looping I principally use Kenaxis, a highly flexible and imaginative program designed by Vancouver violist, laptopper and composer Stefan Smulovitz. To manage the various parameters I use a separate MIDI controller (Wave Ideas’ Bitstream 3x), which provides me with an array of potentiometers, sliders and buttons, as well as a dual-axis joystick, cross-fader and ribbon controller. In 2008 the XIE began experimenting with a number of electronic devices including sensors and contact microphones. Sensors link changes in parameters such as motion, position, light and G-force to responsive electronics; contact microphones allow us to examine sound conduction in various resonating bodies — including the human body and bodies of water. Most exciting of all, however, are the beautiful, unplanned directions in which new media lead us each year. The ensemble’s first year was as much an experiment for me as it was for the students. Given the art form’s rather casually documented history, and the scarcity of instructional models, I sometimes found myself unsure as to how to proceed. I was a relatively experienced improviser, but a very inexperienced teacher of improvisation. In short, I had many questions but few answers. How does one impart to others the seemingly mysterious and illusive skills of free improvisation — the ability to react to the moment in a way that is meaningful yet different every time? How much direction versus freedom should one provide in a rehearsal of free improvisation? Should one focus more on technical skills or philosophical approaches? I soon learned that questions such as these are central to the development of a solid pedagogy of free musical improvisation. During the ensemble’s first year, however, I often found myself realizing just after the fact precisely what a situation required. By year two I was able to carry out my intentions more efficiently, and direct rehearsals more creatively. Now set to begin year three, I can recognize the immergence of some key elements in my approach, which I outline below. I believe improvisation is about nurturing one’s connection to the universal flow of energy. (2) As Henry David Thoreau noted, “Unpremeditated music is the true gauge which measures the current of our thoughts, the very undertow of our life’s stream.” (3) It is about interconnection. It is about immersion — becoming an active part of a dynamic and responsive environment. But one must remain fluidly engaged. Rigidity is simply not conducive to the art of improvisation. As legendary improviser Derek Bailey noted, one must avoid “the establishment of a set of generalized rules … always allowing an individual approach to develop” (Bailey 1982, 138). Indeed one can only enter the improvisatory realm by following the path of freedom, flexibility, and fluidity. As an instructor, it has been incredibly refreshing to work at the level of “pure musicality” — not on preliminary technicalities but directly on intuition and creative expression. (4) In many ways this subjective approach is contrary to other more accepted pedagogical approaches. (5) It eschews standardization and defies quantification, instead nurturing individuality and innovation. Yet it need not be seen as subversive in any way. I believe free improvisation is integral to any level and style of instruction. The greater danger, as I see it, is the objectification of art through rigid formal instruction. The key to cultivating a truly free approach is learning to accept events without judgment. (6) This may at first sound like a passive approach, but it is in fact quite the opposite. One who can effortlessly accept events as they occur is free to choose highly creative responses. Instead of being limited by the confines of one’s own preconceptions and desires, one can be open to an endless stream of new possibilities. This state of mind is often characterized as detachment, though the term can be misleading. The goal is not in fact detachment from desire, rather a detachment from outcome. Instead of being bound by our attachment to the outcome of transitory concerns, we can learn to loosen our attachment to such trivialities and strengthen our connection to what is truly meaningful — in this case, pure musicality. The move toward a more flexible, detached state of mind can be liberating, but it requires a fundamental shift of perspective. One must focus less on judging occurrences and more on simply being aware of them. For musicians, this means listening carefully. “Concern about what is right and wrong,” notes percussionist and educator William Cahn, “is replaced by an effort to be aware of whatever is happening and to search for and find appropriate musical responses — to make good musical choices” (Cahn 2005, 28). Only from a perspective of complete awareness can we produce truly meaningful creative responses. I am grateful to improvisatory actor Stephen Sim for helping the XIE develop a better sense of awareness. Stephen works with the ensemble each year, and always generates intense energy within the group. His exercises illustrate, however, that one must remain keenly attentive (aware) and flexible (detached) at every moment, or this energy will quickly wane. I begin each rehearsal with a meditation exercise. There seems to be a direct relationship between increased awareness and improved creative expression. (7) Although only a novice practitioner myself, I find these exercises foster a state of mindfulness that is conducive to both individual and collective creative expression. Players must learn about themselves, about others, and then that there is no difference between the two. This is where true ensemble awareness begins. In practical terms, meditation provides the necessary perspective for addressing purely musical phenomena, such as intensity and contrast. While a basic understanding of such concepts is often self-evident, their rich dynamism can only truly be understood by one in a state of “flow” — a state of mind in which “action and awareness are merged.” (8) For the XIE, these are moments of intense clarity and collective unity. It is during these moments that the most fundamental learning occurs. Two useful sets of meditation pieces are Pauline Oliveros’ Sonic Meditations (1974), a collection of communal concept pieces focusing specifically on listening and awareness, and her Roots of the Moment (1998), a rich polytextual collection of writings including essays, poems, compositions and exercises. While relatively abstract, these works tend to bring to our rehearsals a clearer sense of musical direction and focus. My intention in introducing them is not to produce slow-moving, meditative music (though this is sometimes one of the results, especially initially), but to direct focus more toward collective listening and less toward individual playing. (9) For many members, Oliveros’ curious pieces produce the desired effect nearly instantaneously. Simply by adhering to an imposed limitation — be it through a narrative, a set of instructions, or a single abstract concept — players tend to adopt a more meaningful intentionality and sense of direction. At once the group becomes more responsive, organic and nuanced — an improvisatory ensemble rather than a collection of individual improvisers. As noted above, our meditation exercises often entail producing creative responses according to a predetermined set of limitations. Through these exercises we learn how to work creatively within a defined role, while also being aware of the overall context. I have found that this skill of responsive role-playing is very useful in, and easily transferable to, a variety of other contexts. In particular, we regularly incorporate it into our performances of live soundtracks. (10) For these performances, designed to accompany short films, roles are typically collectively. The types of roles that one might play vary greatly. Certain roles are very much akin to that of a live foley artist, providing carefully rehearsed sound effects in sync with the video. Other roles require a player to express something more abstract, such as elation or acceptance. In both cases one soon develops in one’s mind a particular interpretation of the role. A role need not be concrete in nature to produce a clear result — abstract roles often produce equally clear results. I have found that, particularly for inexperienced improvisers, the presence of a clearly defined role tends to yield improved focus and direction, both individually and collectively. Figure 3. The XIE performs a live soundtrack to Marcel Duchamp’s Dadaist film Anémic cinéma at Mondragon Bookstore and Coffeehouse in Winnipeg. Photo © 2007 Gordon Fitzell. In free improvisation, as with any other kind of music, it is integral that one listen to great performances, both live and recorded. Quite simply, the more you listen, the more you hear. In the XIE, we typically listen to one piece per rehearsal, allotting some time afterward for discussion. (11) Moreover I feel it is imperative that improvising musicians survey a wide variety of styles — including music that defies classification. The range of artists to whom we listen is vast, including the AACM, Albert Ayler, the AMM, the Art Ensemble of Chicago, Derek Bailey, The Boredoms, Anthony Braxton, Cornelius Cardew, Ornette Coleman, John Coltrane, Morton Feldman, Lori Freedman, The Glass Orchestra, Q.R. Ghazala, François Houle, Keith Jarrett, Jean-François Laporte, Giorgio Magnanensi, Merzbow, Musica Elettronica Viva, Pauline Oliveros, Evan Parker, Sonic Youth, Sun Ra, Cecil Taylor, Otomo Yoshihide, and John Zorn. The important thing is to incorporate listening into one’s regular routine. Just as important as taking time to listen to others is taking time to listen to oneself. In an improvising ensemble, a good way to do this is to divide the ensemble into two groups: a performing group and a listening group. For the XIE this came about as much by fortuitous accident as design. As noted above, the ensemble was rather large during its first year, so I divided it into to two smaller groups. It naturally followed that, from time to time, one group should observe the other and provide feedback. (12) Given the high level of trust and respect that developed between ensemble members, the impact of this process was tremendous; I soon decided to incorporate the process into our regular routine. It has also become a tradition for the XIE to spend some time following each performance discussing the experience, ideally the next day. These sessions provide a forum for performers to comment on strengths and weaknesses of the performance, or more generally within the ensemble. However the sessions are less an assessment of one particular performance and more an opportunity to learn from our experience, so that we can improve our approach at the next performance. The discussions are sometimes quite cursory and other times more thorough. (13) Once again, the important thing is regularity — players need to have a regular forum for reflection, assessment and discussion. “We learn to improvise by improvising,” noted the late percussionist John Wyre (cited in Cahn 2005, 28). Indeed there is simply no substitute for practice. But what does it mean to practice? And how is practice different from performance? Is practice different from performance? If so, is practice fostering or impeding our ability to perform? Improvisatory violinist and violist Stephen Nachmanovitch suggests that if we separate practice from the “real thing” (i.e., performance), then “neither one of them will be very real.” (14) From the outset, it was my intention that the XIE be an active performance ensemble. But I wanted to carry out this intention in way that minimized the conceptual gulf commonly understood to lie between practice and performance. One way to do this is simply to treat both activities as opportunities for learning, and both activities as opportunities for the full expression of art. I have observed — in both rehearsal and performance — three basic stages of development in improvisation. They are: (1) timidity, (2) overindulgence, and (3) balance. (15) In the first stage, timidity, one attempts to process the plethora of new information, but essentially remains at the level of cognitive dissonance. The player wishes to contribute but, unaccustomed to working within in a free environment, is uncertain as to how (or if) to do so. Stage two, overindulgence, is the opposite: one begins to test the limits of freedom, often with little regard for context. Here feedback and self-reflection can play important roles in helping a player discover a path to clear expression. Stage three represents a state of balance and transcendence. If stage one can be characterized as “bad choices,” and stage two as “all choices,” then stage three can be characterized as “good choices.” But it takes practice. The ability to consistently make good choices requires wisdom, which can only be gained through experience. Most importantly of all, however, the ensemble members regularly learn from one another. Each member brings a valuable set of skills and a unique perspective to the ensemble. For some, these skills are largely undeveloped; for others the skills are already well developed. Regardless, each member shares and learns something new each session. For the XIE, the collective model applies not only to the learning-through-osmosis method described above. Collaboration is an integral element of our group dynamic, one that pervades all levels of activity. Of course the ensemble members are not only performers; they are also the composers of each improvised moment. Moreover they are also frequently the designers and curators of an event. A significant portion of our rehearsal time is devoted to the designing of concerts and other performances events. This approach is vitally important because it provides an opportunity for members to contribute to the creative process in a different way. Through collaborative design each member develops a more deeply vested interest in a project, and the group typically produces a more organic and artistically rewarding result. This is in part because, as each project develops, its parameters become more uniquely suited to the talents and eclecticisms of the particular group. Collaboration is often most effective when individuals are able to contribute in different but complementary ways. In the XIE this fact is underscored by the group’s inherently interdisciplinary approach. The interdisciplinarity of the XIE is integral not only to the group’s æsthetic direction, but also to the efficacy of its pedagogy. In fact, the interdisciplinary nature of the ensemble has itself been one of the richest sources of learning opportunities. Over the past two years, members have included musicians, ranging from opera singers to laptoppers to found objects artists, but also some specialists from other disciplines: a video improviser, a visual artist and a software designer. At times the differences between these areas have presented challenges. By and large, however, the necessity of having to find solutions to unfamiliar problems has led us in extraordinary new directions, and has caused us all to grow appreciably as artists. It is said that in every challenge lies an opportunity. In the XIE, often what initially appears to be a problem later reveals itself as an opportunity to better understand the interrelatedness of the players, and the dynamic environment they all share. For many, including me, the experience of performing in a free improvisational ensemble becomes a journey of discovery. One learns how to listen more deeply; to remain alert and adaptable; to accept circumstances without judgment, and to offer creative responses. Above all, however, one learns to trust one’s fellow players and, by extension, the universal flow of energy in the world. The opera singers, it should be noted, ended up being some of the most dedicated and creative members of the XIE. In part because of their dramatic flare, they ignited a spark within the ensemble that expanded its scope far beyond what I had imagined. To my great pleasure, the XIE continues to exceed my expectations. “Xie” is also a transliteration of the Chinese character for the expression of gratitude. This connotation of the group’s name is not entirely coincidental, and serves as a reminder to maintain an attitude of appreciative awareness. I am referring here to something akin to the Taoist concept of Ch’i, the fundamental energy of the universe. For a cogent treatment of the connection between creativity and spirituality, see Peggy Thayer, The Experience of Being Creative as a Spiritual Practice: A Hermeneutic-Phenomenological Study (Peter Lang Publishing Inc., 2003). Violinist and violist Stephen Nachmanovitch argues that while technical practice can help bridge the gap between what we wish to express and what we are able to express, it can also widen the gap. See Free Play: Improvisation in Life and Art (Penguin Putnam Inc., 1990), 67. In Sounding the Full Circle, violinist and composer Malcolm Goldstein asks what the near exclusion of improvisational instruction from the musical training of students tells us about our culture, attitudes, and value systems. See Sounding the Full Circle: Concerning Music Improvisation and other Related Matters (Samuel French Trade, 1988), 9. For a persuasive argument in favour of improved creativity through meditation, see filmmaker David Lynch’s book, Catching the Big Fish: Meditation, Consciousness, and Creativity (Jeremy P. Tarcher / Penguin, 2006). Mihaly Csikszentmihalyi, Finding Flow: The Psychology of Engagement with Everyday Life (Basic Books, 1998). See also Csikszentmihalyi’s Flow: The Psychology of Optimal Experience (Harper Perennial, 1991). Oliveros’ instructions are often simple and complex at the same time—not unlike a Zen koan. The following passage from her Roots of the Moment is representative: “Listen to everything until it all belongs together and you are part of it.” See Roots of the Moment (Drogue Press, 1998), 12. In the XIE we use a variety of abstract scores from various collections including, for example, Cornelius Cardew’s 1972 classic Scratch Music. Our film projects have ranged from recent works by local filmmaker Guy Maddin to experimental film classics by Maya Deren. I recommend drawing inspiration from other art forms as well. Visual art, written word and dance can be particularly inspiring to improvising musicians. On occasion we also use scratch recordings to review our work. This process, while very different from live critique, is also extremely useful — in part because there are no visual cues. In order to ensure that focus remains on the present, I find these self-reflection sessions are best if kept to a moderate length. Numerous theories of learning are applicable to this basic phenomenon. A similar progression could be illustrated, for example, using the well-known four-quadrant “conscious-competence” model of learning: unconscious incompetence, conscious incompetence, conscious competence, and unconscious competence. In addition to our special guests, I also contribute to performances and rehearsals on a regular basis. Bailey, Derek. Musical Improvisation: Its Nature and Practice in Music. Prentice-Hall, 1982. Cahn, William L. Creative Music Making. Taylor & Francis Group, 2005. Cardew, Cornelius, ed. Scratch Music. MIT Press, 1972. Csikszentmihalyi, Mihaly. Flow: The Psychology of Optimal Experience. Harper Perennial, 1991. _____. Finding Flow: The Psychology of Engagement with Everyday Life. Basic Books, 1998. Goldstein, Malcolm. Sounding the Full Circle: Concerning Music Improvisation and Other Related Matters. Samuel French Trade, 1988. Lynch, David. Catching the Big Fish: Meditation, Consciousness, and Creativity. Jeremy P. Tarcher/Penguin, 2006. Nachmanovitch, Stephen. Free Play: Improvisation in Life and Art. Penguin Putnam Inc., 1990. Oliveros, Pauline. Sonic Meditations. Smith Publications, 1974. _____. The Roots of the Moment. Drogue Press, 1998. Rothenberg, David. Sudden Music: Improvisation, Sound, Nature. University of Georgia Press, 2002. Thayer, Peggy. The Experience of Being Creative as a Spiritual Practice: A Hermeneutic-Phenomenological Study. Peter Lang Publishing Inc., 2003. Thoreau, Henry David. “Journal I: 1837–1846.” The Writings of Henry David Thoreau. Houghton Mifflin Co., 1906. Wyre, John. Touched by Sound: A Drummer's Journey. Buka Music, 2002. 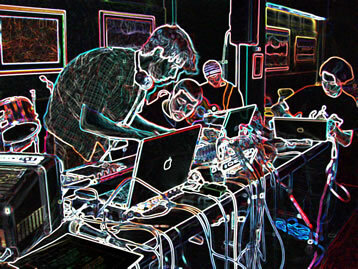 Gordon Fitzell performing live electronics at Ace Art Gallery in Winnipeg. Gordon Fitzell is a Winnipeg-based composer, performer, producer, concert presenter and educator. His music has been performed across Canada and at international festivals including Festival Synthèse Bourges (France), the Darmstadt Internationale Ferienkurse für Neue Musik (Germany), and the International Sound Art Festival (Mexico). 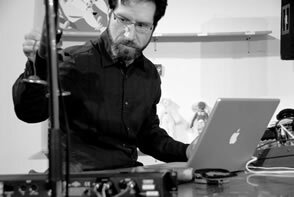 He has received a number of awards for his compositions, including first prize in the electroacoustic music category at the CBC Radio National Competition for Young Composers (1999). In 2003 he co-launched the experimental Music Collective (eMC), an umbrella organization dedicated to the promotion of radically innovative music. His recent compositions include works for New York percussionist Matthew Gold, the Lisbon Architecture Triennale, Winnipeg’s Harrington/Loewen Duo, and the Chicago sextet eighth blackbird, whose Grammy-winning recording strange imaginary animals features two of his works. Fitzell is an Assistant Professor of Music Theory and Composition at the University of Manitoba, where he leads the eXperimental Improv Ensemble (XIE).